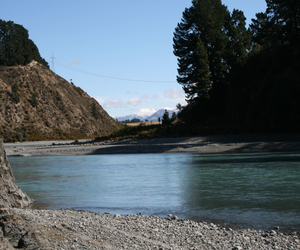 New research from the University of Canterbury has found that a shrinking river is less able to support larger predatory fish, such as the highly-valued sports fish like brown trout or at-risk native fish like galaxiids and eels. Using data from 29 New Zealand rivers, a new research paper by lead author Freshwater Ecology Professor Angus McIntosh of the School of Biological Sciences, UC Science, and co-authored by UC mathematician Associate Professor Michael Plank ,UC biologist Dr Helen Warburton, and collaborators from NIWA and overseas, has been published in the online journal Science Advances. The research findings in the paper – ‘Capacity to support predators scales with habitat size’ – show that reducing the size of a habitat undermines its capacity to support larger predators. “If you make a habitat smaller, for example by taking water out of a river, you shrink the physical dimensions of the space which can reduce the size of predators, such as fish, that live there. When predators are smaller, they are not as efficient in their energy use so the food, such as stream insects, available in the habitat will support fewer and smaller fish,” he says.